Since you are already using a GUI toolkit (pygtk? haven't looked at the source), it doesn't make much sense to have your preferences as local website; if anything, it's a security risk. Any chance that the Preferences feature will be rewritten with a proper GUI? Does this work behind a proxy server? 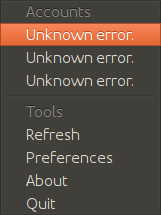 I am trying to add my AskUbuntu Account, but the Preferences dialog just freezes after some time. When you click on the icon, it brings up the window. If you click on the icon while the window is open, it pops up again, instead of closing. Just a small feature request. Please add support for proxies... It would be helpful to people behind proxies. Like myself. 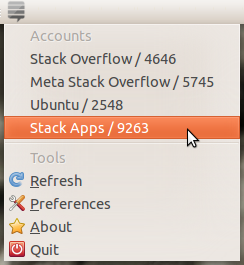 Not sure if this is a bug on my end, but recently the application has been giving me network errors for Stack Overflow, Ask Ubuntu, and Raspberry Pi SE. I attempted reinstalling both via DEB and via the PPA, but it still was giving me errors. and there are no options under Site. Is this a bug somehow, or a result of an API change or the update? EDIT: Found the cause. There is an issue with the 1.5.1 version, 1.5.2 is working almost perfectly. Invalid authorization credentials supplied. Please click on the preferences menu item in the application to view this page. I reinstalled 1.5.2 and I have been getting this. 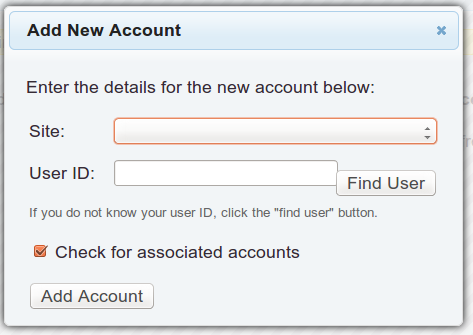 All of the provided accounts from the previous installation are showing the correct rep, but I can't add new accounts. After a long break (due to unsolved problems) I tried using this applet again today following the up-to-date installation procedures (basically using the latest PPA and remembering to check that python-appindicator is installed) but unfortunately this time I couldn't even start logging into my account no matter what I did -- entering my user name or my email address or using "Find User", etc. I started the applet from terminal to see any error messages, but nothing was there to see either.